Marco Ruitenbeek moved abroad in the summer of 2000. 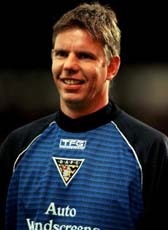 In his first two seasons at Dunfermline, he was a regular starter in the line-up. His last two seasons he was used less. He has left his Scottish club in April 2004 after the club suffered from financial problems. Ruitenbeek returned home and started playing at the amateurs of SV Huizen. When his new club was relegated from the Hoofdklasse, he hang up his boots finally in May 2005.